Al’s career as a custom saddle maker began when his grandmother gave him as set of leather working tools when he was 9-years old. By the time he was in junior high, his ability to stamp came to the attention of Slim Beaver who owned a saddle shop right across the street from the Clovis Rodeo Grounds, home to one of the largest spring rodeos in California. Before long, Al was stamping saddles and other leather items after school. At the time, another saddle maker, CH Mavis, was also working for Beaver. However, due to advanced arthritis in both hands, Mavis’ work was reduced to cutting leather and building saddles as he didn’t have the dexterity required to stamp the intricate patterns popular with the saddle shops customers. 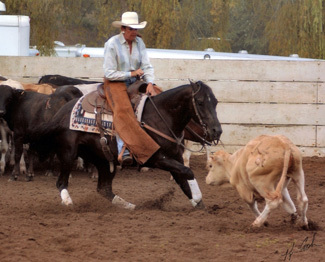 By the time Al entered college, his interest in football and steer wrestling, took his attention away from the saddle shop. However, when Mavis quit working for Slim Beaver, Al was asked to help fill the orders that had stacked up. Al soon found himself building saddles, not only stamping leather. In the late 60s, cutting was becoming more popular in California, thanks to trainers like Don Dodge and horses like Doc Bar, a stallion that was revolutionizing the sport through his progeny. With this trend, came the need for a saddle with a different seat, however, very few saddle makers could satisfy the demand. At the time Al was getting started, Art Vancore, who had a shop in Merced, was the saddle maker of choice. He had been making saddles for top horsemen for years. Vancore had a long waiting list and some of his customers were less than patient. He became aware of the saddles that Al had been building and was impressed; not only with his craftsmanship, but also with the care Al gave to saddle building. When he couldn’t meet a customer’s deadline, he referred them to Al. 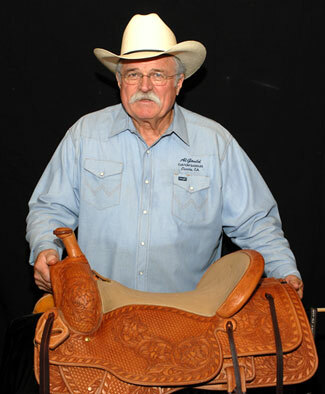 With his endorsement, Al’s reputation as a custom saddle maker and his list of customers grew. In the 1970s, Al was hired by the McPherson Leather Company in Los Angeles to help design saddles to meet the emerging West Coast market. His talents in this area soon attracted the attention of Resistol, the legendary hat company that was expanding into the Western apparel business. Resistol was looking for someone who understood horse culture, especially rodeo. Al was hired and moved to New Mexico and then Texas. In the early 1990s, Al decided to give up the corporate life and return to Clovis where he could dedicate himself to saddle making full time. Since that move, Al has worked to improve his saddle making and leather working skills. He has also built a list of clientele that consist of the region’s top horsemen. Al’s goal is always to craft a saddle that is fully functional and perfectly suited to the person who will ride it. He never duplicates a saddle. They all have the same function but each one is unique, "Each saddle is custom, each saddle is built for a particular person." C.H. Mavis was Al’s mentor in the saddle business in the 60’s. Mavis once showed Al a belt that had only swivel knife cuts. It had been made for him by an Indian leather stamper who worked with him at Porter Saddle Company of Arizona. The belt was the most magnificent piece of swivel knife artwork Al had ever seen. Al said "I had never seen anything like that in leather. If you looked carefully, you could see birds were integrated in the design, yet it just flowed all together. The belt made me realize that you could use the swivel knife to cut in a pattern, or you could use it to make a stand-alone piece of art." The saddles Al now makes are adorned with swivel knife cuts on the fork, cantle and latigo carriers. This adornment had become the signature of his work. The proper use of the swivel knife is one of the skills that Al teaches at the Leather Trade Shows. Al believes that it is by teaching that he can pass on what has been given to him. Al hopes that he can inspire others as he was once inspired.